What business does an SUV have with nearly 600 horsepower? It’s not my job to rationalize that, but it is to go and see what it’s like. Enter the 2019 Masterati Levante GTS and Trofeo, both packing a Ferrari V8, like all SUVs ought to have. We’re well into the age of performance SUVs with enough power to flatten typhoons. We’ve got the Jaguar F-Pace SVR, Range Rover Sport SVR, and the Porsche Cayenne Turbo. 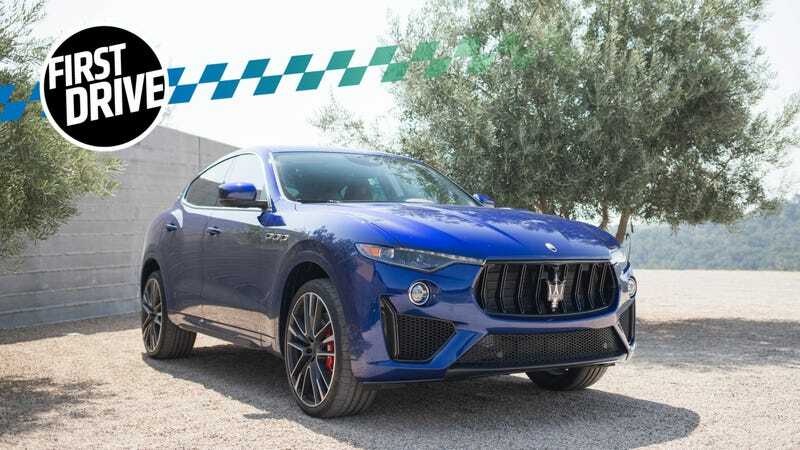 Maserati just so happened to also have a massively powerful Ferrari V8 lying around, so it stuffed it into the Levante. The Levante is Maserati’s SUV, first unveiled in 2016. It’s large and, in our brief drive of it back in February, we found it to be comfortable and luxurious—a nice car for taking on long highway trips. I didn’t personally think that it needed more power, but apparently Maserati disagrees. Considering Maserati’s lengthy history of sports cars, race cars, grand tourers, and sedans, it might seem weird that it produces an SUV at all, but hey, that’s what makes money right now. At least this one is damn quick. And its understated styling keeps it from being too polarizing. The GTS and the Trofeo are the first Levantes to sport a V8, and it’s not just any V8. They employ a 3.8-liter, twin-turbo unit that’s been assembled by Ferrari hands in Maranello. According to a Maserati engineer, the “basement” of the engine is the same as in other Ferraris, but everything else is Maserati-specific. Power output from the GTS is a very respectable 55o horsepower and 538 lb-ft of torque. The Trofeo bumps the HP up to 590 and keeps the torque the same. For those keeping track, that’s only 10 HP down from the current BMW M5, a car that I drove and sagely deemed to be Too Fast. It was intimidating because there was too much power too readily available and using all of it would spell trouble if you weren’t smart about it. I was worried that the Trofeo would make me feel similarly. The V8 Levantes come standard with all-wheel drive and an eight-speed ZF automatic transmission. Maserati claims that zero to 62 mph happens in just 4.2 seconds for the GTS, 3.9 seconds for the Trofeo. When you have an Italian V8, you want to hear it. You want everyone else to hear it. Maserati made sure this is very much a thing that happens. Driving around in Sport mode means that the yowl of the V8 both fills the cabin and the surrounding zip code. The turbos don’t sound like they clamp down on the engine’s vocal chords as much as turbos tend to do in other cars. (I’m looking at you, BMW.) And that engine was the only good part about being stuck in traffic on Highway 1—it made passing a thunderous show of furious noise. Of course, the Trofeo also gives the speed-starved kid living inside you extremely rewarding acceleration pulls. The car leaps to action. Worrying about merging is something that other people do, not V8 Levante drivers. And despite the extremely high HP figure, that acceleration isn’t as manic and violent as you’d think. Certainly it’s not as unhinged as it is in other cars with the same amount of power. The Levante’s weight and AWD system just don’t allow it to be. You’ll never forget the Levante is an SUV while behind the wheel, but its girth isn’t exactly what I’d call a drawback. The car is surprisingly manageable. Obviously I wouldn’t say it’s light-footed, but it doesn’t feel like driving around a boat. On paper, 550 and 590 HP are intimidating figures. In practice, you can floor the throttle and you actually have time to react before you’re traveling at jail-time speeds. It won’t be that much time, mind you—the cars are still extremely fast—but you’ll at least get to enjoy the speed before you have to back off the gas pedal. As for regular, day-to-day commuting, it’s a fine machine to do it in. Steering is a little too light at low speeds, but it never has that sensation of being bored with you for driving slowly. I switched the Trofeo into Corsa mode (which the GTS doesn’t have) when it was my turn to drive it. I expected more noise and increased throttle response—which I got—but I did not expect how much harsher the ride quality would become. It was unpleasant and detracted from the otherwise pleasant experience. I turned the car off of Corsa mode. It still rode harshly. Of course, the Trofeo also comes standard with 22-inch wheels. My god, 22-inches. They’ll jostle you around no matter what you do with it. I asked a Maserati spokesperson what advantages the large wheels have. “Aesthetic,” he answered frankly. 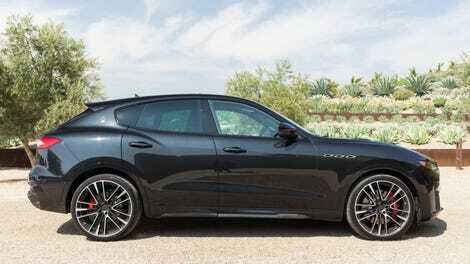 And he’s right: The Levante’s profile is already very sleek and aggressive. That’s aided by the fact that it has huge wheels. Proportionally, they fit. So, for looking cool, the wheels work. But for ride comfort and quality? Not great. Also, strangely, despite how large the car is on the outside, that doesn’t translate to a whole lot of room on the inside. The front passenger footwell is surprisingly narrow and the backseats are cramped. Here’s the thing: Despite a 40-HP difference between the two V8 Levantes, the Trofeo costs $169,980, which is $50,000 more than the $119,980 GTS. That difference is the price of a nicely loaded Kia Stinger GT. Is it worth the extra cash? Personally, I don’t think so. They don’t feel different enough from each other to warrant a such a sticker hike. My gripe against the entire Trofeo is that it feels like it should just be a driving mode on the GTS, which is competent and comfortable in and of itself. After switching into the GTS, my driving partner and I marveled at how much more pleasant the ride was, even after we put it into Sport mode. The GTS rides on pitifully small 21-inch wheels, but even that change was noticeable and appreciated. I wasn’t wincing over bumps and the car actually felt like a luxury vehicle, not an SUV masquerading as a track car. I think this all comes down to marketing. The GTS basically has everything the Trofeo offers, it just doesn’t carry the same top-of-the-line badge, which is extremely important to those who like to collect badges. “What do you think of my new Levante GTS?” one luxury buyer might say. Maserati told us that a simple tune of the turbos results in the extra power. And going over both cars’ spec sheets, no huge or apparent differences between them jump out at me. I’d happily sacrifice 40 HP for a more comfortable ride and a lower price tag. If the idea of a Ferrari V8-powered Levante appeals to you (as it should) and you don’t care about badging, then the GTS is the one for you. Because when the Ferrari SUV comes out, it’s guaranteed to be painfully expensive. There’s no sense in going for that when there’s a perfectly suitable Maserati right here.